Thanks to our NYC adventures we did not have the pleasure of working in our garden this summer but you better believe we are all over getting the fall garden started. Allowing our kale and collard plants to go to seed this summer has brought us lovely little sprouts we are currently thinning and loving. It is time, my people, to begin your Fall garden journey should you so choose to take one...and you should. When thinking about your garden of course you just want to think about what you want to plant. You also need to be thinking about the timing of planting. You need to find out the estimated day of your area's first frost and based on the timeline of maturation for your chosen plants count backward to the frost date (and add two weeks for some buffer growth time) to decide about when you should start your planting. This is of course based on the idea of starting from seed. If you want to start with small plants check with your local home and garden retailer. The timing of planting is the only different or complicated item when it comes to fall gardening. Here is a helpful first frost chart from Better Homes and Gardens. Be prepared to experience a little frost before you want to. 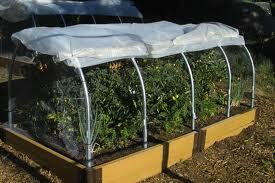 You may also have crops like our favorite, kale, that will last well into the winter if you protect it in the evening. One thing we have done is find sturdy branches or left over building materials to stand at the four corners and one in the center of our beds in preparation for covering them when frost does come. You can you recycle old holey sheets like we do or if your neighbor hosts a slip-n-slide in your back yard and leaves a large sum of plastic sheeting that is useful as well. :-) You can also get real fancy and create PVC Pipe archways over your beds to create more of a greenhouse look with the same slip-n-slide plastic. When covering your garden make sure you don't forget to uncover it before the warm afternoon sun or you may come home to some wilted, dead little veggies. this is the fancy I am talking about...thanks google images for the example. Preparing your soil and planting the seeds would mimic the same tips I shared in our last gardening post. I would also suggest mixing in your own compost (composting is always a good way to reduce waste and pump up your garden read this to learn more) or natural fertilizers to revive the soil a bit after your spring/summer gardens. Remember to water often as your start your seeds in the late summer heat. Enjoy getting your hands dirty and reducing your grocery store trips this fall!